The second edition of the Atlanta Barbeque Classic, Pinstripers auctions and a 50/50 raffle on each day of the show highlight a few of the marquee Speedway Children's Charities fundraising events on tap for the 2018 Summit Racing Equipment Atlanta Motorama, Georgia's motoring festival, at Atlanta Motor Speedway April 28-29. Founded in 1982 by Speedway Motorsports chairman Bruton Smith, the Atlanta chapter of Speedway Children's Charities is a 501(c)3 nonprofit organization committed to raising funds to be awarded to qualified children's charitable organizations in the metro Atlanta area, and the annual Atlanta Motorama is one of its busiest weekends of the year. Begun at last year's show, the Atlanta Barbeque Classic adds a tasty if not unique element to the motoring festival that will have auto enthusiasts' mouths watering as they celebrate Atlanta Motor Speedway's gigantic two-day celebration of anything with an engine. The barbeque cook-off, officially sanctioned by the Kansas City Barbeque Society, heralds competition among many of the most notable meat-cooking connoisseurs in the South. The two-day contest is open to any and all barbeque competitors ready to put their secret recipe to the test and will include challenges preparing brisket, chicken, ribs and pork. Contest entries will be judged by an official panel, with a total purse prize of $10,000. Show attendees can visit and explore the barbeque competition area free of charge with admission to the Atlanta Motorama. For those interested in sampling some of the delectable competition creations, wrist bands will be available to purchase for $5 and will provide five one-ounce samples from any of the teams competing. 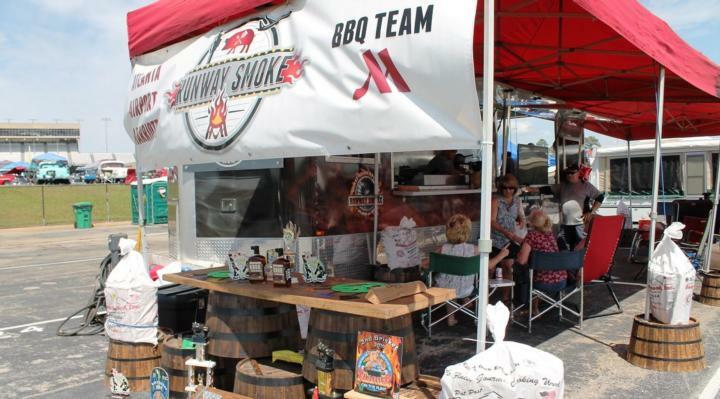 Competitor entry into the Atlanta Barbeque Classic is $375 and includes a 20' x 20' space, 50-amp electrical power and up to five Atlanta Motorama entry passes. Larger spaces are available for a nominal fee. Entries are accepted through April 27 and will be based on a first-paid basis for up to 48 teams. Competitors can register online at www.atlanta.speedwaycharities.org or by completing and sending an official entry form to Atlanta Motor Speedway. Three pinstripers auctions - two on Saturday and one on Sunday - will also directly benefit the Speedway Children's Charities' Atlanta Chapter. Show attendees will have the opportunity to bid on unique hand-painted items ranging from bowling pins to aluminum automotive panels and everything in between, just moments after each masterpiece is created. The pinstriping artists will be crafting their works of art live in the Pinstripers Panel Jam located inside the Motorama Show Car Garage throughout the weekend. Pinstripers auctions will take place at noon and 3 p.m. on Saturday and at 1 p.m. on Sunday, with all proceeds going directly to SCC. The Speedway Children's Charities 50/50 raffle will also take place on both days of the 2018 Atlanta Motorama. Fans can purchase 50/50 tickets for $5 apiece or 6 for $20, with the owner of the winning ticket taking home half of the total proceeds and the other half benefiting SCC. The 5th Annual Summit Racing Equipment Atlanta Motorama returns to Atlanta Motor Speedway April 28-29, 2018, and registration is still available. Participant entry is open to anything with an engine, ranging from classic cars, muscle cars and custom cars, to imports, rat rods, hot rods, trucks, big rigs, motorcycles and even boats and RVs. For more information or to register your vehicle today, visit www.atlantamotorama.com or contact the Atlanta Motor Speedway ticket office at (770) 946-4211 or (877) 9-AMS-TIX.